Here's a permanent page for my Pokémon sales! You can also check out my customs sales for pre-made items and commissions for phone straps, bookmarks and such. All pictures are links to the big version! Some of these photos are gonna be from my collection, but many are the stock images or other peoples' photos (cut over from my wants post). As always, if I've used one of your photos and you want it taken down, just ask! Here are some of my figures who fit nicely on standard tabletop bases (big on click). Kid figures: The big munchlax in this picture is a kid figure on a large (2x2 on a D&D grid, or roughly 50mm circle) base. I'm not an expert on kid figures, but most seem to be more or less the same size. In D&D terms, you can probably find lots that are perfect for large creatures, but they definitely won't fit on medium. Random gashapon: The substitute in the pic is from a gashpon set of paired subby+pokemon. That doesn't mean much, since gashapon come in a million different scales, but you'll have a decent selection of pokemon in the 25-38mm range. Finding which ones will work from which sets, will be the problem. Bottlecap figures: The munchlax on the sculpted base is a bottlecap figure. His base is a BIT larger than the standard grid, but so close! Other bottlecap figures might fit nicely, though there doesn't seem to be as large a range as in, say, kids or zukan figures. Choco Egg figures: The zigzagoon is a choco egg figure, and he fits perfectly on a 25mm base. (That tail needs some clearance though, obviously :p) Choco egg figures may be a good source for D&D minis, as they're all made to fit on a standard sized base. Footprint/dex figures: The munchlax on the wooden base is, I THINK, a "footprint" figure. He fits excellently, and IIRC they are mostly the same size. Like the choco egg figures, they come with a standard base size, so you'll have a good chance of finding figures that will fit the 25mm circle/square nicely. 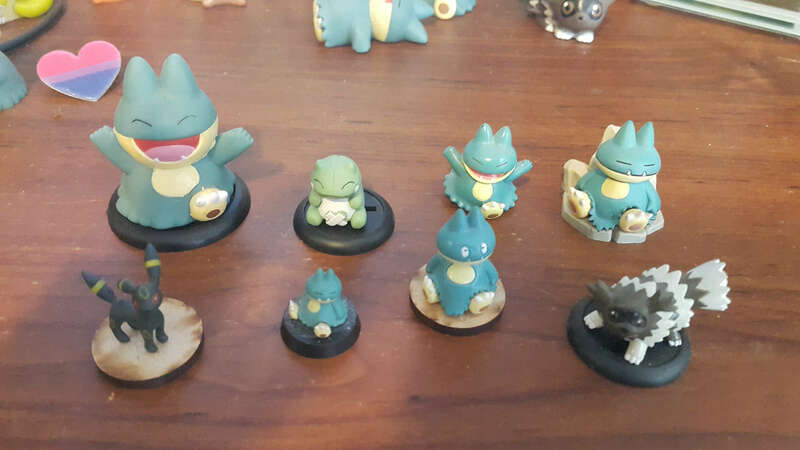 Zukan figures: The last two are zukan figures - the umbreon on a medium (25mm) base, munchlax on a small (~13mm) base. As you can see, there's a lot of clearance for them on the medium base, and even the umbreon fits nicely onto the small base. Zukan are in scale with one another, rather than being sized for a standard base, so if you want a nice range of figures in different size categories, these will do a great job. Minicots, stampers and others: Unfortunately I don't have any of these in my collection. Maybe somebody else could advise me? I could never go past zukan figures for D&D use! I'm biased toward them anyway, since they're mostlky very high-quality figures, but also I love that they're in scale with one another. If I put a bulbasaur and a venusaur on the table next to each other, I want the venusaur to be a lot bigger, right? Of course, zukan will probably not be the cheapest to buy ^^; Some, especially the older ones, are extremely expensive now. Also, many zukan don't stand up nicely without a base - if you don't want to glue them to a D&D base, I recommend just using some plasticene. For fliers who go on pegs, you could drill a hole into a big-standard plastic base to fit the peg - giving much the same style as the plastic WotC and Paizo pre-painted minis. On the other hand, if you value a standard base size rather than relative scale, the choco-egg figures seem like a good bet. They're not too rare for the most part, and they're still releasing new series, so it shouldn't be too hard to build up a good collection. As an alternative, if you want to use only pokemon figures for a game - like, not mixing in any normal tabletop minis - what about going double size? If you use a 50mm grid rather than 25mm, you could use kid figures and have access to a very large, very affordable range of monsters. Of course it won't work if you have modelled scenery sized for 25mm grids, but if you're drawing/printing the scenery it could be a great solution. Hey there folks! Here's a little page for my custom work. You can buy this stuff from my shop online, or through comments here if you prefer (prices are the same, so it's really up to you). My favourite things are figures in unusual poses, rather than the stock pokedex type pose - so things like clipping figures, ippai figs, chess figs, TFG figs and whatnot. Also, I prefer things that are on-model - that is, proportioned like the pokémon is normally drawn. For example, while I love kid figures of cute mons like munchlax and charmander, I would pass on a kid-styled suicune or serperior. Of course, if I do have a "main" it's munchlax, which is truly my totem. I'd love to be tagged on sales with munchlaxen. I love the heck out of zukan figures. Not only are they (usually) great for being on-model, they're the right scale for use in D&D! Which is another of my truest loves ^.^ So, please feel free to tag me in on any zukan sales. Things I'm not looking for: With occasional exceptions, I don't generally collect plushes (too big, too squishy). Also, I don't care for the various poncho/costume merchandise lines—I'm just not into critters wearing person clothes. Finally, as a rule I prefer a pokemon's standard colour scheme to any others—shiny colour palette, metallic/pearl/glitter variants, and clear variants don't really interest me. OKAY, now on to the wants list! ...Because I'm not, not really. Much like my Tumblr, this account exists for no other reason than so I can comment on stuff I care about (and hopefully so I can buy tiny plastic monsters). If you actually want the content I make, check out Invincible Ink for games and commercial items, She Bites for all-ages art/toys/resources, and Carousal for adults-only art/toys/resources. Nerd. Artist. Game Developer. Atheist. Skeptic. Humanist. Pornographer. Social Justice Barbarian. She/Her, cis. Diversity or GTFO!